Discussion in 'Replica Props' started by SgtFang, Jul 18, 2006. SgtFang Sr Member Gone but not forgotten. Ok so I've got this idea about raising the bar on RG helmets. I want to make them out of a glossy red urethane rubber, so the wearer can actually turn their heads in them. 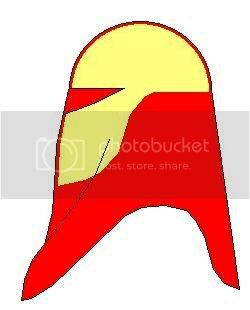 There would be sort of a skull cap shaped under-helmet that would keep the crown and facial parts of the helmet in place, sort of like the Spiderman mask in the movies. The trickiest part I can think of so far would be securing the visor in place. Maybe we could pool our resources and nail down a definitive run? Interesting thoughts about the composite helmet. Can't wait to hear more. Just thinking, how about taking a spandex type of material and placing it over a mold (old DP helmet coated with a release agent) then coat the spandex in latex and let it harden. Next make the inner helmet like you have shown and place it over it cut out the visor area and sandwich the latex between the visor material and the hard inner shell. My biggest concern is being able to breath in this thing. Followed up by being able to see. I'd really love one though...of course then I'll need a force pike. Anyone got a tutorial? Let me suggest that you design the scull piece so that you can attach a breathing tube, and that there is airflow around the scalp to reduce sweating there. Preferably, any breathing tube would take care of both air supply and air you exhale... since warm exhales would increase the warmth when it is distributed inside the helmet. This being important for both comfort and conciousness. If you rebreathe too much of your own exhaled carbon dioxide you will eventually pass out. This will be worse, the more active you are. Just do what the troopers do and put a 12v computer fan in it and exaust down your back.